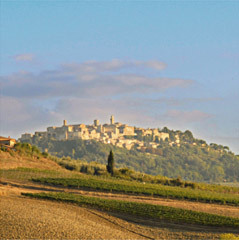 Vino Nobile di Montepulciano is one of Italy ’s oldest wines. The numerous Etruscan archeological sites scattered throughout the territory surrounding Montepulciano testify to the area’s winemaking vocation traceable all the way back to the 5th century B.C. In a document from the year 789 Emanuele Repetti wrote about a cleric named Arnipert who offered the Church of San Silvestro in Lanciniano sull'Amiata a piece of land cultivated with vineyard located in the castle of Policiano. In another document dated 17 October 1350, the same Repetti lists the regulations for the sale and export of wine produced in the district of Montepulciano. Then, in 1685, Montepulciano’s “Noble Wine” is also mentioned by the poet Francesco Redi who, in addition to praising it in the work “Bacco in Toscana” (Montepulciano is the King of all wines! ), wrote an ode to Count Federico Veterani dedicated exclusively to praising the great quality of this wine. The wine produced in Montepulciano continued to win praises throughout the years until it obtained the Controlled Designation of Origin (DOC) seal in accordance with Italian Ministerial Decree of 12 July 1966. In 1980, Vino Nobile di Montepulciano became the first Italian wine to be sold with the government band officialising the DOCG Controlled and Guaranteed Designation of Origin appellation.